Our hockey dryers offer a unique and convenient way to keep all your hockey gear dry. If the term “hockey dryer” sounds foreign to you, it won’t for long. Williams Direct Dryers’ new SportsDryer™ is not only a premier hockey skate dryer, it is also the perfect hockey glove dryer, helmet dryer and more. As much as any athletes, hockey players must deal with uniforms that get wet and soggy during the hard-hitting action. Our hockey gear dryer weighs just 29 pounds, making it completely portable and transportable. Why is a sports dryer, and a hockey drying rack in particular, important to your team? It’s important because drying hockey gear between periods will keep that gear safe from bacteria and disease that could be transferred to your players. No one wants to wear wet gear, and never before has it been so easy to keep sporting equipment in prime condition throughout the course of a game. 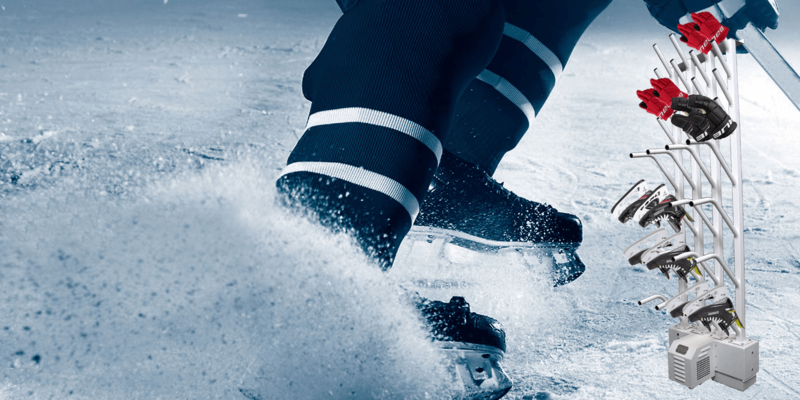 Hockey players are among the most amazing athletes we have, and keeping your players safe and warm will allow them to perform their best. 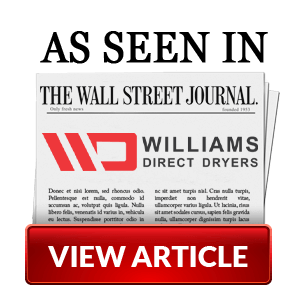 Williams Direct Dryers has been around since 1989, and our sports dryers are just the latest in a long line of state-of-the-art creations that has kept us at the top of our industry. As a hockey gear dryer our SportsDryer™ is unsurpassed, and is a must have for any hockey team serious about keeping its players safe and comfortable. In the past, the idea of a hockey skate dryer or hockey glove dryer you could keep on-site to dry gear during a game was just a pipe dream. Today Williams Direct Dryers has made it a reality. As with any athletic endeavor, you want to give your team every advantage possible. Dry, warm and comfortable hockey gear will give you that advantage, and keep your team away from the risk of disease caused by contaminates in the process. In other words it’s a win/win situation! Our SportsDryer™ has room to dry eight pairs of just about any kind of sports apparel. In fact, given its lightweight nature and portability you’ll be amazed at just what a heavy duty dryer it really is. That’s par for the course for every product from Williams Direct Dryers, and we’re proud to offer such convenience and reliability to sports teams just like yours.